Divorce is no fun for anyone. But a new study shows that it affects men and women in different ways, with women more likely to take a financial hit, and men an emotional one. According to the Sun-Herald, an Australian study has found that men's incomes go up an average of 20% in the four years following divorce, while women go down 2%. But in the feelings department, women fare better — a year after divorce, 48% of still-single men reported feeling lonely, compared to only 39% of still-single women. Somewhat encouragingly, by four years after divorce, these levels fall to 29% and 28%, respectively. None of this is completely surprising. 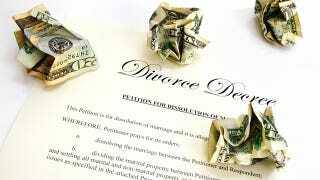 The financial fallout of divorce has long been a well-known problem for women. And men's post-divorce loneliness and lack of community have been cited as possible reasons why some men strive to remarry quickly. This bit, though, is pretty interesting: though men make more money after divorce than women do, they're also more likely to describe themselves as "poor." Says study co-author David de Vaus, "It doesn't mean men are just moaning. We don't know what their expenses are." We also don't know if men simply have a lower threshold for feelings of poverty than women do, or if being lonely actually makes them feel more financially insecure. These questions are worth further study. It's clear that financial and emotional health effect one another, especially after events like divorce that deal a blow to both. And understanding these interconnections could help both men and women bounce back.